In the window between Thanksgiving and Christmas I usually like to do some projects with my kids that will wind up being part of our gift to the grandparents. This year I am giving salt dough ornaments a try. I remember making these for our tree and for my grandparents and I'm anxious to have my little guys create their own. I found a very easy, step-by-step, dough recipe and pointers at Kaboose.com. Although they note the project is for 7-year-olds and up, I really think if parents are handling all of the oven work (obviously) and monitor the painting- really even toddlers can participate (nobody wields a paintbrush like my 2-year-old!). From Kaboose- This shiny Christmas dough ornament craft is the perfect finishing touch to decorating the tree. It can also be altered and made into lapel pins, magnets and gift-toppers. 4. Roll out the dough to about ¼” thick with a rolling pin that has been dusted with flour. 5. 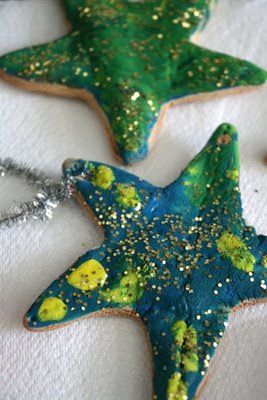 Use cookie cutters to cut out as many trees and stars as you want. 6. Use a toothpick to make a hole toward the top of the shape. Poke the toothpick into the shape, then holding toothpick straight up and down, make a circular motion as if you were stirring something. Keep circling until the hole is the size you want. If your toppers are large enough, you can make two holes in each so that you can thread ribbon through like a button, only showing a small amount of ribbon on the front. 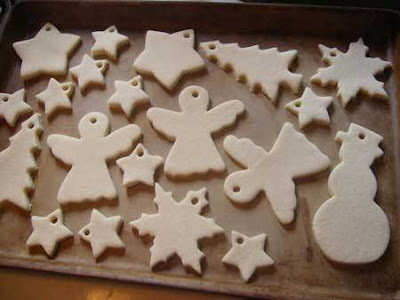 Uncooked salt dough doesn’t keep well, so only make enough dough for the ornaments you are going to make. If you are only making a few toppers, halve the ingredients above. The listed amounts will make enough ornaments for a classroom of 20. While I was researching this project, I came across some sophisticated and intricate examples of salt dough ornaments that I just loved at katyelliott.com. 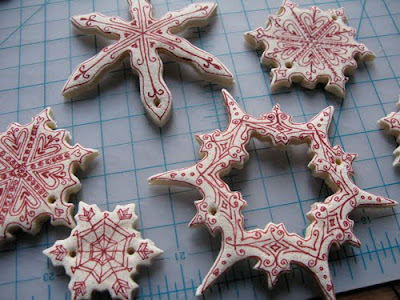 These beautiful snowflakes are inspiring me to make some "grown-up" ornaments as well!